Lake scenery near Point de Galle. 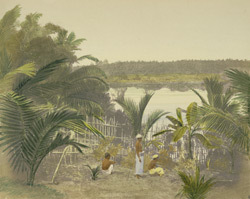 bl.uk > Online Gallery Home	> Online exhibitions	> Asia, Pacific and Africa Collections	> Lake scenery near Point de Galle. Photograph by Frederick Fiebig from an album of 70 handcoloured salt prints, of scenery at Point de Galle in Sri Lanka (Ceylon). Fiebig's photographs of Ceylon, probably taken in 1852, are considered the earliest surviving photographic record of the island. Galle, on the island's south-western coast is on a rocky promontory and its name possibly derives from the Sinhala word for rocks, 'galla'. With its natural harbour, it was the main port of Sri Lanka since antiquity, and a significant stop in the Arab trade with the East in medieval times. The Portuguese arrived here in the early 16th century and built a small fort which they fortified under attack from the Dutch. Galle was taken by the Dutch in 1640 and prospered while they rebuilt the town and strengthened its fortifications. The British took over from the Dutch in 1796 but their commercial interests were concentrated in Colombo and in the 19th century Galle gradually declined in importance, being supplanted by Colombo as chief port after the construction of the breakwater in Colombo harbour in the 1870s. Today it is a quiet and scenic town with the many surviving structures from its Dutch period lending it interest. There is a profusion of trees within the town and along the shore there are palm trees, coconut trees and breadfruit trees.